Beets are quickly becoming one of my favorite veggies. For many years I swore them off, but I think that’s because I was only eating the strange canned pickled beets which don’t exactly do beets justice. Working with fresh beets though can be a serious pain that many people just aren’t willing to deal with. Not only do they stain everything they touch, but if you buy a bunch of beets it’ll most likely come with this freakin’ plume of greens that are dirty and, most people think, useless. I used to think they were useless. I’ve since realized that I almost like the greens more than the beets themselves! As soon as I get a bunch of beets i chop off the greens and thoroughly wash them to remove all the dirt. They are awesome in salads. But I wanted to do something more with them. I figured it would be fun to stuff a beet… with beet greens. It’s some serious beet-on-beet flavor that’s pretty amazing. Roasted beets hollowed out and stuffed with Gruyere cheese and blanched beet greens. An awesome appetizer! 1) Cut beets off stems. 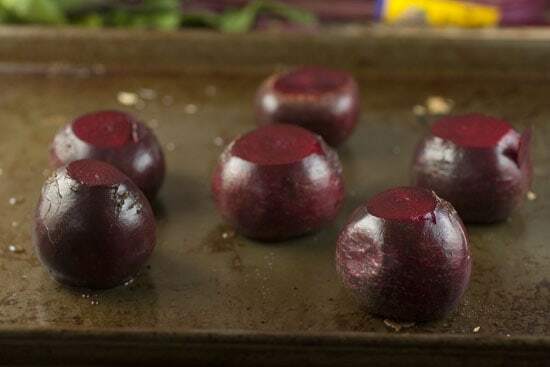 Cut roots off beets and sit them on a baking sheet. 2) Bake beets at 350 degrees for 50-60 minutes. Let cool before peeling. 3) For filling, cut greens off stems and cut out any large ribs from greens. Wash well under cold water. 4) Blanch greens in simmering salted water (1 Tablespoon of kosher salt per gallon of water). Cook for 20 seconds. 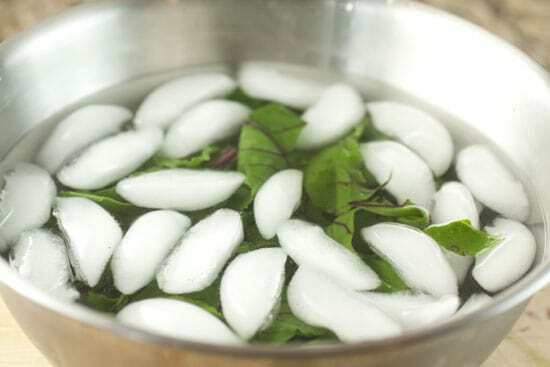 5) Remove greens and dunk in cold ice water immediately. 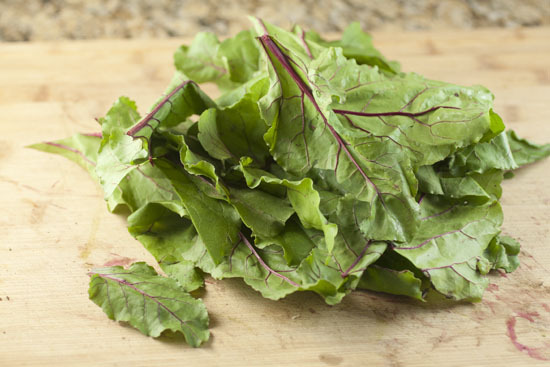 6) Remove greens once chilled and dry off with a paper towel. Then chop up greens. 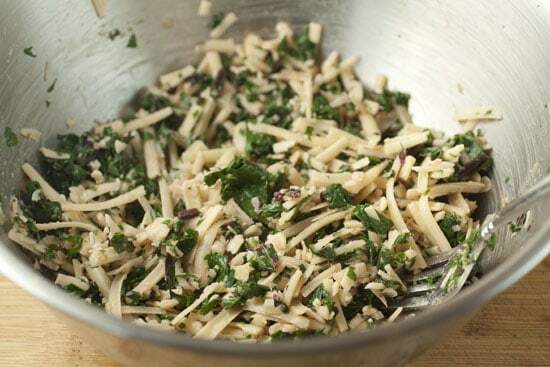 7) Add chopped greens to grated cheese and lemon juice. Season with salt and pepper. 8) Once beets are cool peel them with a paring knife and make a large well in the center of the beets. 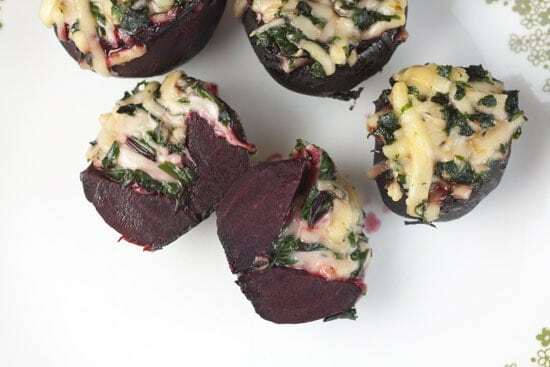 9) Stuff beets with filling. You probably won’t use all of it, but save the leftovers for quesadillas. 10) Bake beets for another 10 minutes to melt cheese. Serve immediately! As you can see, there isn’t a lot of ingredients for these guys. That’s okay though because the ingredients that are there have plenty of flavor. Obviously since we’ll be using the greens also, make sure you buy full bunches of beets and not the bulk stuff where the stems are cut off. 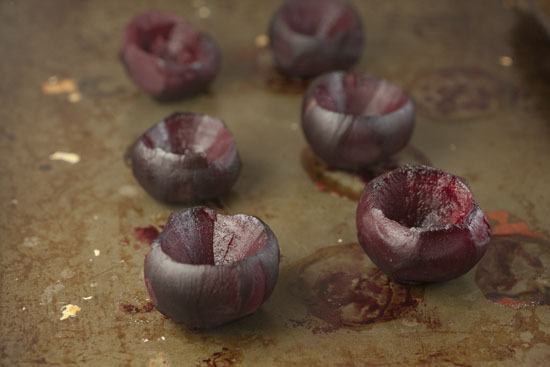 Shoot for medium-sized beets for this recipe. Too small and you won’t be able to stuff them. Too big and they’ll take forever to roast and be kind of unwieldy. Ideally these are a 2-3 bite appetizer. You’ll need to roast the beets before you try stuffing them so slice them off the stems and cut the root parts off as well so they lay nice and flat on a baking sheet. Bake these guys for 50-60 minutes at 350 degrees. They are done when a sharp knife can be pushed into the center with very little pressure. They should be nice and tender. Cut off any of the really large stems and if there are any large ribs going down the center of the greens, cut them out as well. You want mainly greens. Rinse these really well with cold water. For some reason beet greens attract dirt. Actually, they probably don’t attract dirt more than any other green, but I don’t think the producers really wash them well like they do lettuce. Probably because most people just throw them out. Anyway, once you have them clean, dunk them in a large pot of simmering, salted water (1 Tablespoon of kosher salt per gallon). Keep them in the water for just about 20 seconds. You just want to lightly wilt the greens. Then pull them out and immediately transfer them to a bowl with ice water. This will shock them and stop the cooking. It’ll also keep them really bright green which is nice. Pull the greens out of the ice water and dry them off a bit on a paper towel. Then dice them up and mix them with the grated cheese and lemon juice. Season it a bit with a pinch of salt and pepper. You don’t need anything else to make a really great filling. This will be more filling than will fit in your beets most likely. Save the extra though. I made a quesadilla with the leftovers on day two that was pretty out of this world. When the beets come out of the oven, they will be too hot to work with right away. Let them cool for about 10 minutes. Then you need to peel them and core them. This is a messy job and your hands are gonna get a bit stained. Wear gloves if you’re worried about it, but I never do. The stain washes off pretty easily honestly as long as you don’t let it dry completely. 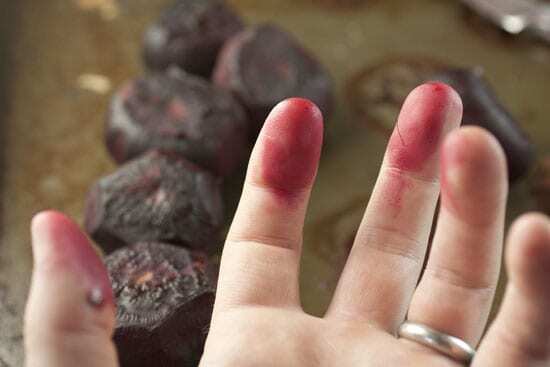 The stain of the beet! To peel beets, use a good vegetable peeler or a sharp paring knife. I like using a knife because the skins are pretty thick. Just run the knife around the edges and the skins should pull off pretty easily. Then dig out a big well in the center of each beet. Save the part that you dig out for salads and stuff. You worked hard to roast these beets! When is comes to stuffing these guys the only rule is stuff in as much as you possible can. When you can’t fit in any more stuffing, then they are stuffed. 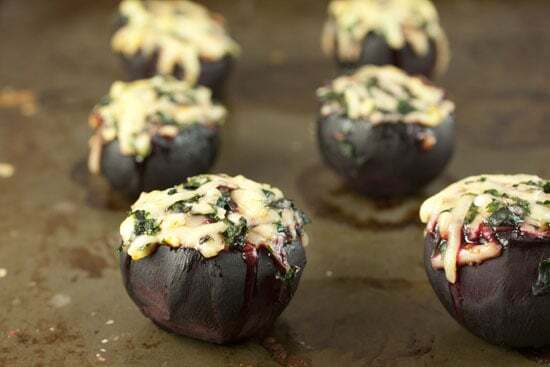 Stick the beets back in the oven for another 10 minutes once they are stuffed just to melt the cheese and mingle all the flavors. I chopped one of these open just so you could see the insides. They had awesome flavor and a great texture. Gruyere cheese melts so perfectly in stuff like this. You have to love it. Other cheeses you could use though are swiss, goat, or maybe even a light cheddar. If you’re not afraid to get your hands a little stained, this is a huge winner in my book. What a timely post. I am just getting ready to start my successive plantings of beets for the cold frame. These look so good, and I love that you included the greens. I love beets! These look delicious! Thanks for the inspiration of another way to enjoy roasted beets! Great post. I just received beets in my CSA share and I have no idea what to do with them! BEETS! Boil them, then slice and pan fry in butter. Yum! You can also grate them raw and toss them with orange slices and mint for a great, quick, refreshing summer salad! I know I comment on your posts all the time, and yours is without a doubt one of my Top 5 favorite blogs, but I have to give you major ups for this one: This is some inspired stuff, right here. I'm super into it. I really enjoy your blog and have followed your recipes to many a successful meal, but this is the first time that I felt like I could maybe tell you something. I "roast" beets in my crockpot. Its perfect in the summer when you don't want to heat up the oven and they come out exactly as if they were roasted in the oven. I just wash the beets (I leave some of the green stems on) add maybe a couple of tablespoons of water, set on high for a couple of hours (med sized beets) until fork tender, peel and they are done and fabulous. I will be grabbing some at my market on Saturday and stuffing them your way for sure! Living in Amsterdam now means I have cheese-galore to choose from and it is no where near as hot as in the US, so this will be made for dinner tonight! 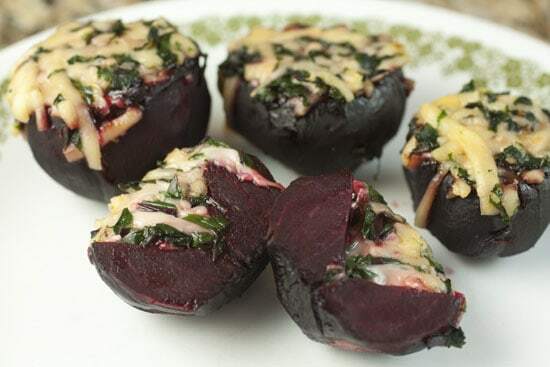 Wow, your stuffed beets look amazing! I have fresh beets in my garden and will make your festive dish for dinner one night soon. I've roasted them, pickled them, and made carpaccio with them, but never thought of stuffing them. Thank you for this fabulous idea! This recipe is awesome! So outside of the box… I signed up for a CSA share this year, and was looking for inventive ways to use my veggies. 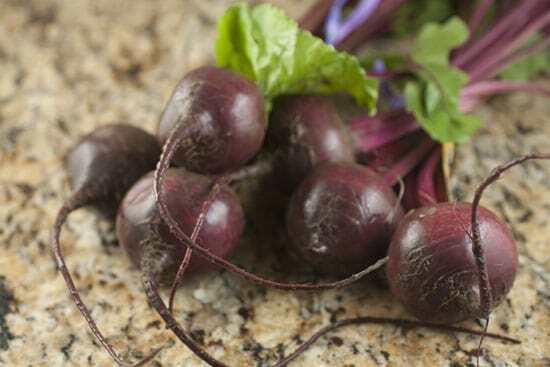 You can only eat roasted beets or beet salad so many times.. My chef boyfriend was blown away and wants to make these at his restaurant with local beets.. Thanks, Nick! :) I always search your blog before I look anywhere else for recipes. I had those roasted beets stuffed with a hot beet mousse – superb. Any help to do this?